The parents of a girl who was found walking alone at Haverhill Park have been arrested for Child Neglect. UPDATE: The parents of a girl who was found walking alone at Haverhill Park have been arrested for child neglect. The Palm Beach County Sheriff's Office says at 11:40 a.m. on Saturday, March 23, 2019, the parents of the found little girl reported their daughter missing. PBSO detectives responded to their address in the 5000 block of Stacy Street to interview the parents, Jolanda Larose Alexandre and Makenson Alexandre. The couple said they did not realize they left their child at the park on Friday, March 22, 2019 at around 7 p.m. The child had been missing for more than 14 hours. The Florida Department of Children and Families removed the other 7 children from their home. 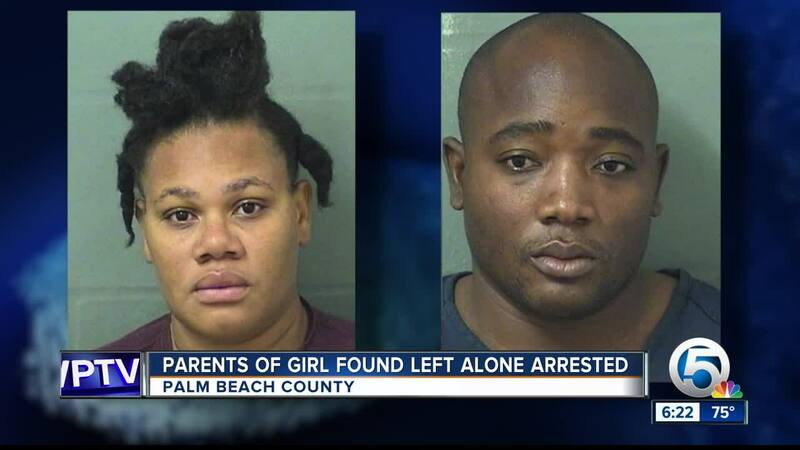 Both parents were arrested and charged with one count of Child Neglect. PALM BEACH COUNTY, Fla. -- Deputies are searching for the parents of a little girl they say was walking alone at Haverhill Park, located at 5470 Belvedere Road. The child, who is possibly 2-years-old, was found Friday evening. She was wearing a pink short-sleeve shirt, white and gold tutu and clear plastic shoes. Several deputies canvassed the area, made loud announcements and initiated a reverse 911 call, but they say nothing helped. DCF was notified and is currently in possession of the child. Detectives ask anyone who knows who the child is, who her parents are, or has any helpful information to contact PBSO Dispatch at 561-688-3400.